There has been a long standing issue with Firefox not loading font from different origin than the current webpage. Usually, the issue arise when the fonts are served on CDNs. With the introduction of Amazon S3 CORS, is there a solution using CORS to address the font loading issue in Firefox? edit: It would be great to see a sample of the S3 CORS configuration. edit2: I have found a working solution without actually understanding what it did. If anyone could provide more detailed explanations about the configs and the background magic that happens on Amazon's interpretation of the config, it will be greatly appreciated, as with nzifnab who put up a bounty for it. OK, I finally got the fonts working using the config below with a little tweak from examples in the documentation. My fonts are hosted on S3, but fronted by cloudfront. I'm not sure why it works, my guess is probably that the <AllowedMethod> GET and <AllowedHeader> Content-* is needed. If anyone proficient with Amazon S3 CORS config can shed some lights on this, it'll be greatly appreciated. Some developers are facing issues of Cloudfront caching the Access-Control-Allow-Origin header. This issue has been addressed by the AWS staff in the link (https://forums.aws.amazon.com/thread.jspa?threadID=114646) below, commented by @Jeff-Atwood. From the linked thread, it is advised, as a workaround, to use a Query String for differentiating between calls from different domains. I'll reproduce the shortened example here. You will notice the Access-Control-Allow-Origin has returned different values, which got past the Cloudfront caching. I'm going to go through my entire setup so that it's easy to see what I've done, hopefully this helps others. Background Information: I'm using a Rails app that has the asset_sync gem to put assets onto S3. This includes fonts. 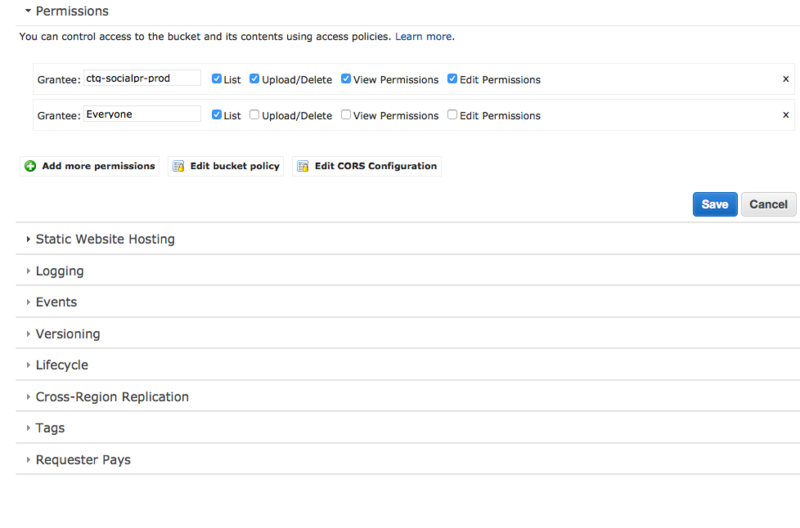 3) Hit cloudfront with a different origin (but one that is allowed on CORS for the S3 bucket) - the Access-Control-Allow-Origin is not cached! yay! Note above that the domain has successfully changed without a query string hack. P.S. It is worth noting that when doing curl -I (capital I) will NOT show the Access-Control-Allow-Origin headers as it only a HEAD, I do -i to make it a GET and scroll up. Well, the documentation states that you can stick the configuration as "the cors subresource in your bucket." I took this to mean I would create a file called "cors" at the root of my bucket with the configuration, but this would not work. In the end I had to login to the Amazon S3 administration area and add the configuration within the properties dialog of my bucket. In my case, I hadn't defined XML namespace and version in CORS configuration. Defining those worked. There is a better and easier way! I personally prefer using my DNS subdomains to solve this problem. If my CDN is behind cdn.myawesomeapp.com instead of sdf73n7ssa.cloudfront.net then browsers are not going to freakout and block them as cross domain security problems. To point your subdomain to your AWS Cloudfront domain go to AWS Cloudfront control panel, select your Cloudfront distribution and enter your CDN subdomain into the Alternate Domain Names (CNAMEs) field. Something like cdn.myawesomeapp.com will do. Now you can go to your DNS provider (like AWS Route 53) and create a CNAME for cdn.myawesomeapp.com pointing to sdf73n7ssa.cloudfront.net. This configuration worked for me. I can list object, retrieve, update and delete. Remember to replace "mydomain.com" for your domain. After this, invalidate the CloudFront cache (CloudFront / Invalidations / Create Invalidation) and It will work. Restarting my spring boot application (server) solved the problem for me. I had configured CORS correctly on S3. The curl was giving the correct response with origin header. Safari was fetching the font correctly. It was only the chrome who was not willing to accept the CORS. Go to your Bucket properties -> Permissions -> Add more permissions -> Grantee: Everyone and check the 'list' option. Hope fully this is going to be useful for someone. Not the answer you're looking for? Browse other questions tagged css firefox amazon-s3 font-face cors or ask your own question.